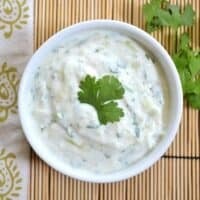 Cucumber raita is a quick, flavorful, and fresh sauce to cool spicy entrees or side dishes. Peel the cucmber and slice in half lengthwise. Use a spoon to scoop out the seeds. Grate the cucumber on a large cheese grater and place into a colander. Add a pinch of salt and allow it to sit while you prepare the rest of the sauce. In a small bowl, combine the yogurt, salt, cumin, and coriander. Stir to combine. Roughly chop the cilantro and add to the bowl. Peel the ginger and grate it (using a fine cheese grater) into the bowl. After the cucumber has been sitting for at least ten minutes, press it into the sides of the colander to extract as much moisture as possible. Add it to the sauce and stir to combine. Serve the sauce immediately or refrigerate to allow the flavors to combine. Adjust salt as needed. This sauce should keep in the refrigerator for approximately 5 days.